We have been waiting for this one, and Thomas Scott left it for last. 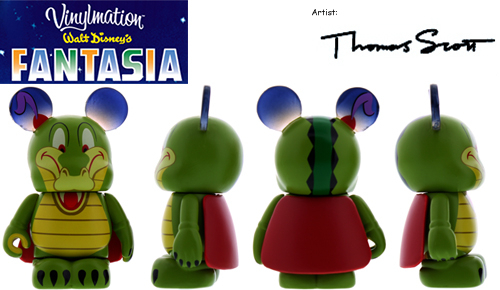 The famous Gator and Hippo from Fantasia are the 8th and final two piece combo in this wonderful series. It will be released at the parks and online on June 28. Like the rest of the series, it will be $24.95 and LE 2,000. There are many ways we thought the Gator could fit on the Mickey platform, and I think Thomas did a wonderful job. The color in the ears have always given this series and added flare. This combo is no different. The Gator’s face extends down onto the body and fits on there so well. Its all about proportions to make it look right, and this is pulled off so very well. This series has and need accessories, so the cape is perfect. The Hippo is simple and elegant. We do have two Hippos already, but this is the first normal 3″. We have the 9″ with fabric skirt and the 3″ that was the chaser from the Disney Store’s light up series. I do want to see this one in person. As much as I like it, I might have liked a lighter shade for the Hippo just to make it pop some more. I do love the purple eye lids and other highlights that really help the design. It doesn’t seem like this series has had the same excitement around it as others, but in the end, all 16 figures came out really great, they feature some really obscure characters that aren’t usually represented in merchandise, and unlike other movie themed sets (Lion King, Alice), this set is limited edition, which is always a plus! Kudos to Thomas Scott!! Why is it the Lone Ranger, when Tonto’s always there?